Reg then gave up Judo in favour of Kendo at the Stoke-on-Trent dojo with John Shaw, John Lovett, Terry Brough, Steve Plimbey and Phil McLaughlin et al. 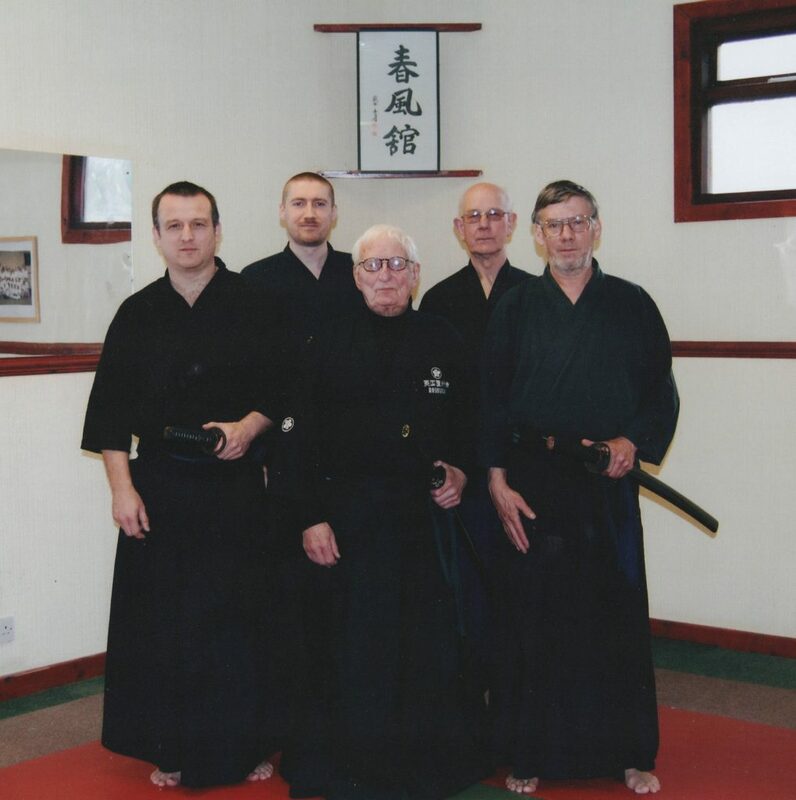 This naturally led to a wider interest in swordsmanship including tuition in Tenshinsho-den Katori Shinto Ryu under Claudio Regoli Brizzi sensei of Milan and Eric Louw sensei of Amsterdam, both visiting the Stoke-on-Trent dojo to teach. 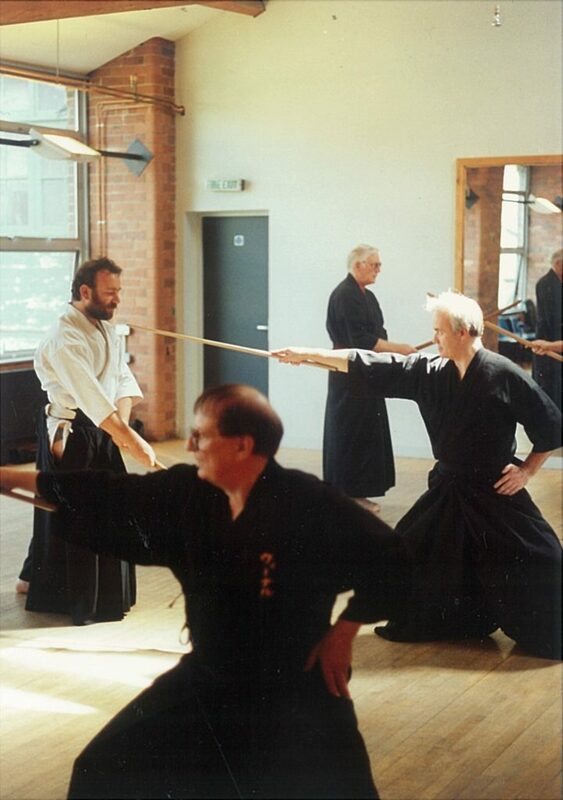 Being a man keen on widening his interests Reg started to learn Muso Jikiden Eishin Ryu iaido under Don Harvey sensei of Musashi UK in the early 1990’s. However, this group had a disagreement with the British Kendo Association in the mid 1990’s but formed a strong, and lasting, relationship with Iwata Norikazu sensei (Hachidan Hanshi) of Kagawa. Iwata sensei held regular annual seminars in Japan and the UK, leading to the association changing its name to Eikoku Roshukai at his suggestion. In the course of time Iwata sensei penned calligraphy for each dojo around the UK and gave the Stafford dojo the name Shunpuu Kan (under Reg as a regular attendee at the UK seminars). This dojo remains extant under the leadership of Terry. Eikoku Roshukai had students practising Hyoho Niten Ichi Ryu and/or Katori Shinto Ryu as well as iaido. Iwata Hanshi allowed this to broaden the students’ appreciation of other ryuha. The picture here shows Reg practising the first waza (Sasen) of Niten Ichi Ryu in the late 1990/early 2000’s (you may also recognise a young Tim Hamilton and Neil Kemp in the background). Part of the Katori Shinto Ryu that Reg enjoyed was naginata jutsu and bo-jutsu. Again, Iwata sensei was happy for Reg to teach students the basic forms of these kata to help them improve their balance, posture and ashi-waza. Reg was always more than happy to help and share his knowledge with others, which rubbed off on his students, some of which are shown in the photograph below. It is with these examples that his students continue to practice their budo/bujutsu following their own line and preferences but with the guidance and confidence Reg instilled in each of them. He will be sorely missed.